The biggest challenges that new mothers face during the initial weeks with the baby at home is that they are expected to balance the household chores and baby care simultaneously. Moreover, the mother also has to take care of her own self to ensure that she is recovering as expected. Postnatal care services are not just essential for the mother, but it is also essential for ensuring that the family gets its time together. Fathers and other members of the family are also equally affected by the new and changed way of their life. As a result, it is not usually possible to do so many things at once. There are two types of postnatal care services available. These two types are live-in services and part time services. While a live-in service means that the postnatal care professional will stay with you 24 x 7, the part time services professional will only stay with you during the day. The services offered in both these cases are similar. However, the only difference lies in the availability of the professional. In the former case, the professional is available to you all the time. On hand, in the case of the latter, the professional shall not be available to you during the night. A majority of the people opt for postnatal care services for their babies. The mothers are not bothered about their own health or stress that they may subject to, but the fact that they are not at the best of their health and may not be able to take care of their baby as well as they can. A day-time confinement nanny can help you with baby massages, baby’s regular visits to the physician and general baby care tasks. In addition, the nanny has years of experience in baby care and is also experienced enough to sight issues and can contact the doctor immediately. As the mother recovers, a day-time postnatal care professional can facilitate her recovery by giving her postnatal massages, taking care of her medicine courses and keeping a tab on her progress. Any complications, if they may arise, can be identified at an early stage and treated to avoid long term issues. A subsidiary task of a day-time confinement nanny is to prepare confinement meals for the mother (for full day job). The nanny is an expert on the postnatal dietary needs of the mother and child. Therefore, she can prepare food accordingly and ensure that the mother and the baby are getting the kind of food that they require. Besides, daily errands like light laundry for the baby and mother also a part of the day-time confinement nanny. This reduces the family’s burden. Day-time Confinement Services are extremely essential for proper mother and baby care. Besides, it gives you the opportunity to enjoy this time and spend time with your baby. Depending upon your background, we can provide you professionals from the Indian, Chinese or Malay (Muslim) background. 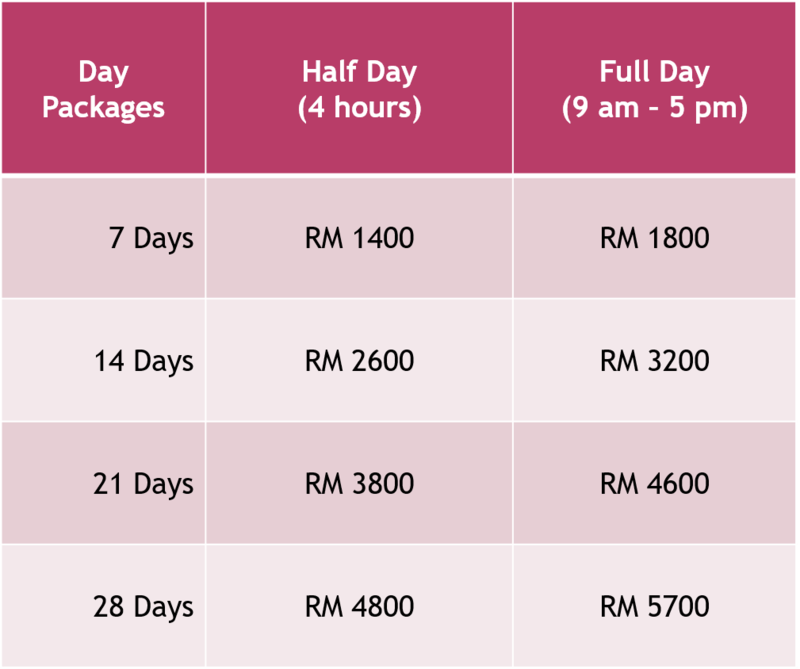 *The package price above is valid within Klang Valley areas and are subject to additional transport charges. The prices vary according to locations, seasons and other circumstances. What are you waiting for…?? Call +6 012 200 7794 to book our Day Time Confinement Nanny NOW!